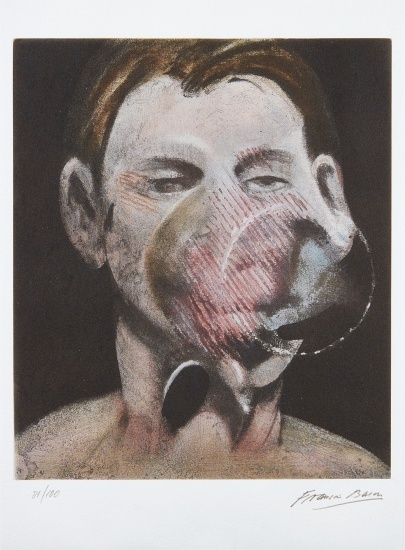 Francis Bacon was a larger-than-life figure during his lifetime and remains one now more than ever. Famous for keeping a messy studio, and even more so for his controversial, celebrated depictions of papal subjects and bullfights, often told in triptychs, Bacon signified the blinding dawn of the Modern era. His signature blurred portraits weren't murky enough to stave off his reputation as highly contentious—his paintings were provocations against social order in the people's eye. But, Bacon often said, "You can't be more horrific than life itself." In conversation with yet challenging the conventions of Modern art, Bacon was known for his triptychs brutalizing formalist truths, particularly Three Studies for Figures at the Base of a Crucifixion, which Bacon debuted in London in 1944, and Three Studies of Lucian Freud, which became famous when it set the record for most expensive work of art at auction at the time it sold in 2013. Signed and numbered 81/100 in pencil (there were also 45 in Roman numerals and 10 artist's proofs), published by Éditions Georges Visat et Cie, Paris, framed.